They say that you should shoot for the stars so that if you fall short, you’ll still land on the moon. We shot for the stars and landed, well, in the stars. Together with our friends at Ora, we were able to accomplish all of our goals and more. Mindful Live! Presents Carbon Nation. On Thursday, September 23rd Lisa Elkins, our principal LEED AP, participated in a panel discussion for Mindful Metropolis on the subject of the film Carbon Nation. The film was presented and party goers were able to discuss the effect the film will bring to the green community and what future plans Carbon Nation will have on climate change solutions. Carbon Nation is a documentary movie about climate change SOLUTIONS. Even if you doubt the severity of the impact of climate change or just don’t buy it at all, this is still a compelling and relevant film that illustrates how SOLUTIONS to climate change also address other social, economic and national security issues. We meet a host of entertaining and endearing characters along the way. • Carbon Nation is an optimistic (and witty) discovery of what people are already doing, what we as a nation could be doing and what the world needs to do to stave off climate change by moving to a low carbon economy. • Public opinion is sliding the wrong way – far fewer people are concerned about climate change than even a year ago. Carbon Nation offers an entertaining, informed and pragmatic primer about why it’s incredibly smart to be a part of the new, low-carbon economy: it’s good business, it emboldens national & energy security and it improves health & the environment. • Carbon Nation’s optimism and pragmatism is appealing across the political spectrum. While other good films have been about problems, blame and guilt, Carbon Nation is a film that celebrates solutions, inspiration and action. Other panelists included: Jim Slama of FamilyFarmed.org and Jason Rothstein author of Carless in Chicago. 2 Point Perspective co-hosted Chicago’s eco-friendly movers and shakers last week to celebrate the launch of the greenest dental studio in Chicago-land. 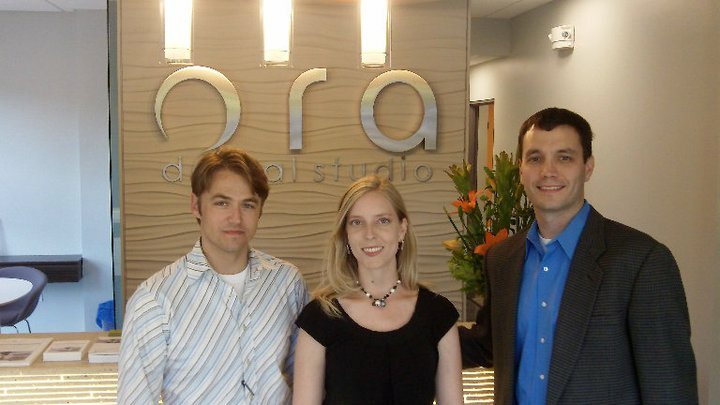 Ora Dental Studio is setting the bar for eco-dentistry practices, and they have a strong commitment to their patients as well. Their eco-dentistry approach follows the Green Guide for Health Care, and their new Wicker Park office space speaks volumes in it's super "green" status. In a successful collaboration between eco-dentistry and eco-architecture, Ora Wicker Park was on course for LEED Silver Certification but made it to Gold Certification. Additionally, it received a GreenDOC certification as well as a CleanMed Conference's Environmental Excellence Award for their commitment to sustainability.) Architectural tours through the space highlighted design elements such as the eco-resin doors used for the treatment rooms, a multitude of recycled materials, and efficient lighting which filters around sculptural drywall soffits. While not quite as glamorous, 2 Point made sure to include a super efficient mechanical system, Energy Star appliances, low flow plumbing fixtures, and a dedicated recycling area. Guests dined on Tocco catered hors d’oeuvres and sipped Lynfred Winery’s Organic Wine and Peak Organic Ale. The real success of the evening was the honor of celebrating another first for green architecture in Chicago! From "Big" to "Big Enough"
The American Dream has long centered around the home, and no one beats America when it comes to dreaming big. Literally. Since the 1950s, homes have doubled in size, and we’ve continued to fill them with more and more stuff. However, since the recession, people are finally beginning to question if they really need all that extra space. That meaning is much easier to find when your family members aren’t nine rooms away watching the flatscreen in their bathroom. From an eco-perspective, unnecessarily large homes mean that additional building materials are manufactured and transported, and additional furnishings must be purchased to fill the additional square footage. Once completed the space must be heated, cooled, and cleaned for years to come. Don’t get me wrong, I’m not suggesting that everyone live in a 600 square foot one bedroom home (though several of my architect friends in Europe live in stunning small spaces). Different people have different family sizes, lifestyles, hobbies, and each home must be able to accommodate their needs. A good architect can create a clever plan that accommodates a clients needs, has a graceful ‘flow’, and minimizes square footage, and can help to ensure that your home reflects the things that are meaningful in your life. Rather than getting stuck in the ‘bigger is better’ mentality of the recent past, try shifting to a ‘better is better’ state of mind. Get one handmade table instead of a cheap knockoff you’ll replace in a few years anyway. And all those scary upfront costs that come with going green? They can nearly disappear if you trim back the square footage a bit. If you’re building or moving, step back and ask yourself if you really need a guest kitchen or a playroom for each of your children. Rather than spending all your time heating and cooling and maintaining your big house, spend it enjoying the things that give you meaning in a home that is ‘big enough’. We are very excited to announce that one of our clients, Karen Weigert, is a producer on the film "Carbon Nation". It will be showing tomorrow, August 10th, in Millenium Park. The show is free to the public, live music will start at 7pm and the screening will begin at 8. Carbon Nation is a positive, solutions-based, non-preachy, nonpartisan, big tent film about tackling climate change while boosting the economy, increasing national & energy security and promoting good health & a robust environment. The festivities will feature performances by comedian Hal Sparks, the star of Shrek The Musical and The Happiness Club, a green carpet event with celebrities and the director, producers and stars of Carbon Nation. Join us! We'll be there. via 'Carbon Nation Premiere in Millenium Park'. Many of you who have worked with us know that Ron and I are the lead architects at 2 Point, but there's no way we could handle all the work that comes into this office without the help of our amazing architecture team. Our team goes above and beyond for every project. Last weekend we had our company retreat (thus the casual attire in the photograph), and it was a great opportunity to step back from our hectic project schedule and talk with the hard workers that keep us afloat. From CAD renderings to 3D models to LEED checklists, these 4 help us take care of the crazy amount of things that need to be done every day. So thanks to (from left to right) Matt Tillman, Ben Guler, Emily Wilbrandt and Ji Noh for all they do! We wouldn't be here without you. These guys show a level of dedication that keeps us going green and going strong, we couldn't do it without you. We formed a great partnership with Evergreen Oak a long time ago. We've used their products and services for years and we've never been disappointed. 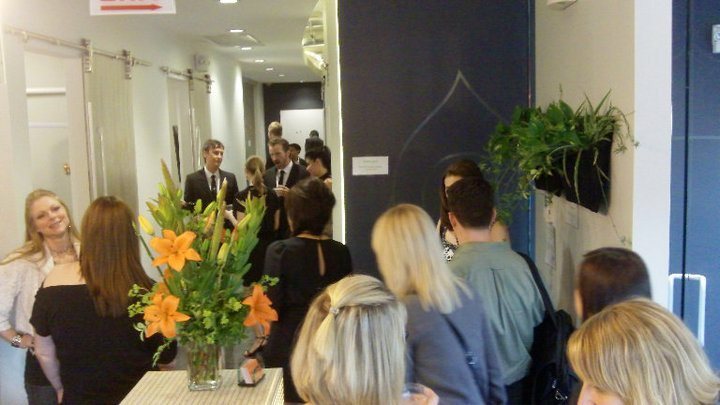 In fact, we loved them so much that in 2008 we redesigned their showroom. Evergreen Oak (our future Green Exchange neighbors) embodies a strong commitment to lighting design and technique, as well as a dedication to sustainability. A feature that gives you the inside scoop of some of 2 Point's favorite vendors. Colori - Michelle Quaranta has a revolutionary way of looking at paint, from how it’s manufactured to how it makes you feel at the end of the day. Her holistic vision of paint not only creates stunning spaces, but also healthier home and work environments. In 2006 she opened Colori as part of the Coatings Alliance cooperative, and became a vendor we know we can always count on. This is a store that will not only help you find which colors are best for you, but how you can keep your white (or brown or yellow or red) walls green. Did you know that I am not alone in my quest to spread 2 Point’s message of green architecture throughout the Chicago area? In addition to an amazing group of architects, we have a marketing team in place to help spread our message. These great people have been instrumental in helping 2 Point get organized, gather the latest eco-info, and helping to turn our archi-speak into a message that normal people can relate to … plus they take a great picture! Thanks to Patrick Rock, Claire Friedman, and Brian Felt for all they do! These guys prove that work can be fun when you believe in what you are doing. Exciting news! Today we updated the lease for our upcoming Green Exchange office space… as we’ve grown we realized that we will definitely need a bigger space than we originally thought! The 250,000 square foot building will hold dozens of green tenants, including 2 Point and several of our current neighbors at 1030 W Chicago. 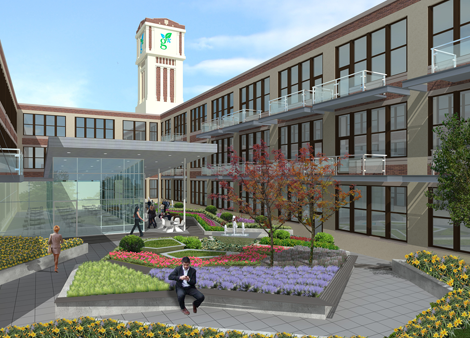 The building at 2545 W. Diversey Parkway is pre-certified as LEED-Platinum under the USGBC’s Core and Shell program. 2 Point is also proud to be the architect for several of the tenants moving into the Green Exchange (GreenChoice Bank, Evergreen Oak Electric and the gX Shared Office to name a few…). Want to know more? Go to the Green Exchange website for the full scoop. For those of you who don’t know of the Green Exchange, it is a retail and office space dedicated to eco-friendly and sustainable businesses. A ‘green Merchandise Mart’ if you will. All Green Exchange tenants are committed to environmentally conscious practices and the building is itself an eco-friendly structure. Some green features include a solar thermal system, 41,329 gallon rain cistern, and state of the art recycling system (the high efficient heating/cooling, windows, and lighting fixtures all go without saying). The shell building has been pre-certified to a level of LEED Platinum! So, for now I invite you to join my excitement. In the future, I look forward to inviting you to join the grand opening festivities for this project Let us enjoy these small victories, and hope that this is just the first of many steps in the right direction. More information about the Green Exchange; including the history of, tenant profiles, and green features can be found at www.greenexchange.com.